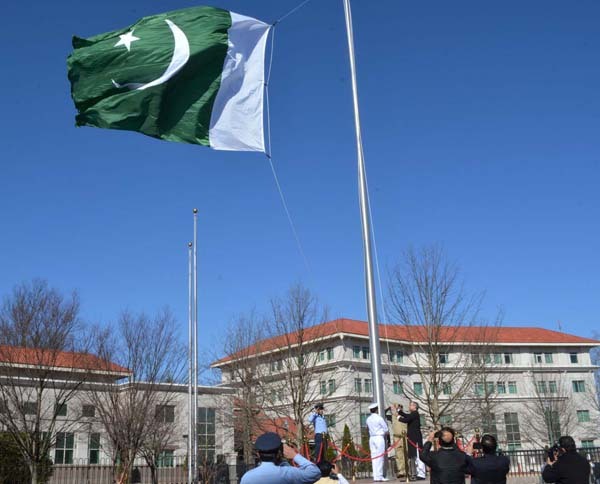 NEW YORK, Mar 23 (APP):An elegant flag-hoisting ceremony was held at the Embassy of Pakistan in Washington D.C. on Saturday to commence the 79th Pakistan Day celebrations. according an embassy press release received here. Pakistan’s Ambassador to the US , Dr. Asad M. Khan, raised the Pakistani flag in the Embassy courtyard and read out the special messages of President Dr. Arif Alvi and Prime Minister Imran Khan on the occasion. The ambassador congratulated the Pakistani-American diaspora who were celebrating Pakistan Day with traditional fervor. A special citation of Maryland Governor Larry Hogan congratulating Pakistan was read out by Maryland Secretary of State John Wobensmith, who then presented it to the ambassador. The ceremony was attended by members of the diaspora as well as Embassy officials.